Why hello there San Diego summer! You sure came out of nowhere fast. One minute I'm wearing jeans and light layers, and the next I'm sweating it out on the Fourth of July in shorts and a tank. I must've brought some of the Palm Springs heat back with me from my anniversary getaway! Combatting the summer heat is a must. And what more beautiful and delicious way to do so than with homemade popsicles! 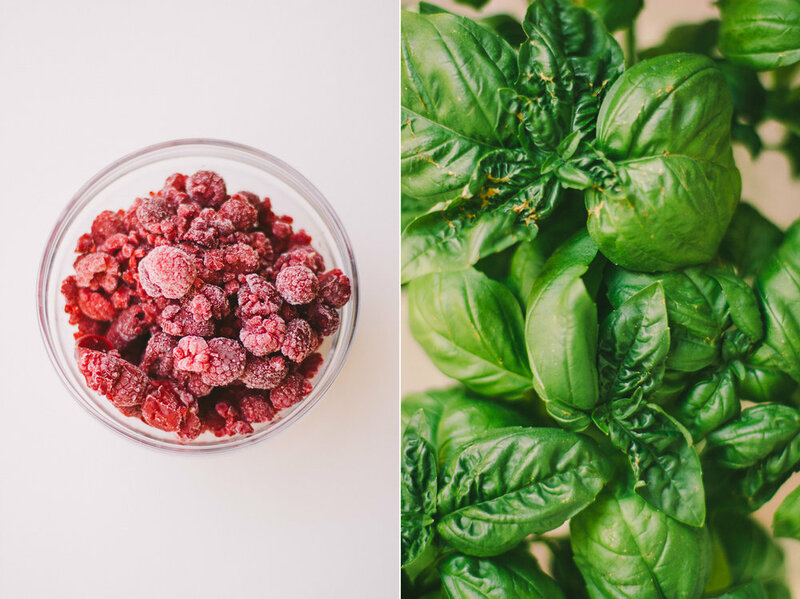 These Raspberry + Basil Pops come together quickly, with minimal time over a stove and maximum time spent relaxing. The leftover basil syrup can be stored in the refrigerator for one to two weeks, and used in a variety of ways. Use it to sweeten and flavor iced tea, or stir it into sparkling water to make your own soda. This is my celebratory purchase and use of my beautiful new Vitamix Professional 750 that I've been saving for for ages post! Hooray! Recipe inspiration comes from this tasty little book, People's Pops, from the famed Brooklyn pop shop of the same name. Begin making the basil syrup by heating the sugar and water together in a small saucepan until the sugar is fully dissolved, and the syrup is just simmering. Turn the heat off immediately, as you do not want any of the syrup to evaporate. Add the basil leaves to the saucepan, and stir until wilted. Allow the basil leaves to continue infusing the syrup while it cools. Once the syrup has cooled, remove the basil leaves and squeeze them over the syrup for maximum basil flavoring. Place fresh or thawed raspberries in blender. Add the mascarpone or coconut cream, and the basil infused syrup. Puree in the blender until smooth, and the mascarpone or coconut cream is fully integrated. If you're removing the seeds, strain them out. Get out a popsicle mold, and splash a little whole or coconut milk in the bottom of each mold (this is so that they get pretty marbling and streaks). Pour the raspberry puree into the molds, leaving a little room at the top of each for the mixture to expand as it freezes. Place the lid on your popsicle mold, and place popsicle sticks into the holes. Freeze for 3-4 hours, or until frozen solid. When pops are fully frozen, fill a sink or large bowl with enough hot water to submerge the popsicle mold in water without going over the top of the mold (no wet pops please!). Let the popsicle mold sit in the water for a few seconds, until you are able to release the pops from the mold with a gentle tug. Working quickly so that they don't thaw, wrap the pops in plastic wrap or place individually in small bags. Place in the freezer. You can store in the pops in the freezer for up to a month (although I strongly doubt they will be around long enough for that). Enjoy!